All the updates from Jakarta and Palembang, as India got their Asian Games campaign up and running. Indian sportspersons are in action in as many as 10 sports on Monday. Here is the entire schedule for India on Day 2. 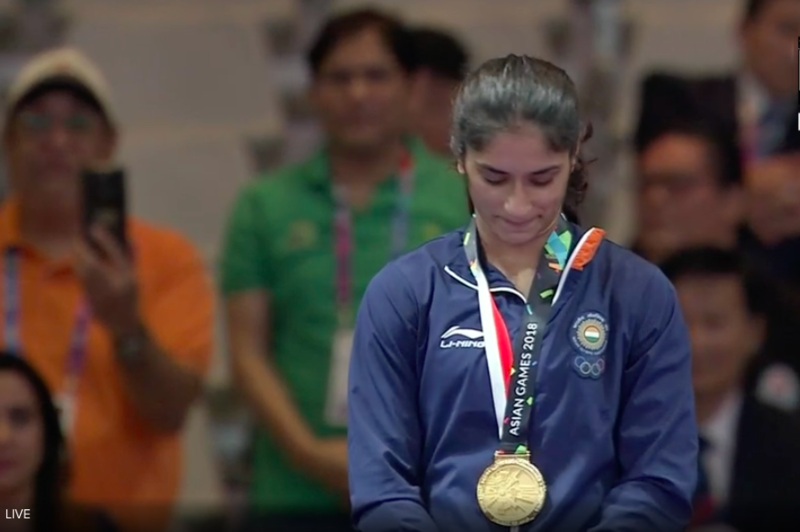 08:47 pm: And that brings an end to India’s day at the Asian Games. Three more medals added to the kitty. A memorable gold for Vinesh on the wrestling mat and silver medals for Deepak Kumar and Lakshay Sheoran in the shooting competition. Three Wushu bouts, three wins. Narender Grewal wins in the Men’s Sanda -65kg Round of 16. Rohan Bopanna and Divij Sharan are through the men’s doubles round of 16 with a straight sets win. India have hammered Indonesia 17-0. Coach Harendra will sleep well tonight. Three Indians competing. Two wins. One still to compete. Santosh Kumar progressed to the quarter-final of Men’s Sanda 56kg with a 2-0 win. In the Men’s Sanda 60kg category, Surya Bhanu Pratap Singh progresses to the quarter-final as well with a 1-2 win over Indonesia. 07:58 pm: That is it from the Wrestling mat today. Sakshi Malik, Pooja Dhanda, Sumit Malik: Defeat in bronze medal bouts. Pinki: Lost in the pre-quarters. Sumit fails to win the bronze with a slow, ponderous display. First period: Slow but powerful. But the Uzbek gets one point – due to passivity. Second period: Another point for the Uzbek – once again due to passivity. Poor tactics and intent by Sumit. He just didn’t attack at all. Heartbreak for the Indian men’s contingent as they miss qualification for the team final by 0.35 points, finishing 9th overall. None of the gymnasts qualified for apparatus finals. Yogeshwar Singh finished 10th in the vaults and is a reserve for the final. 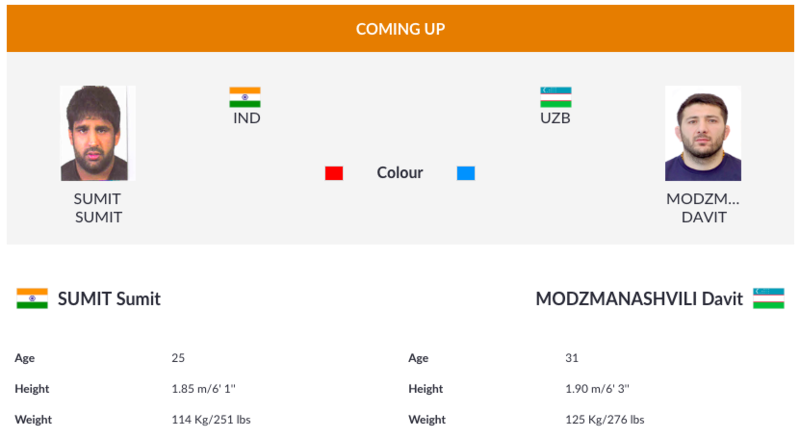 07:31 pm: Sumit’s bronze medal match in the Men’s Freestyle 125 kg category is up next. 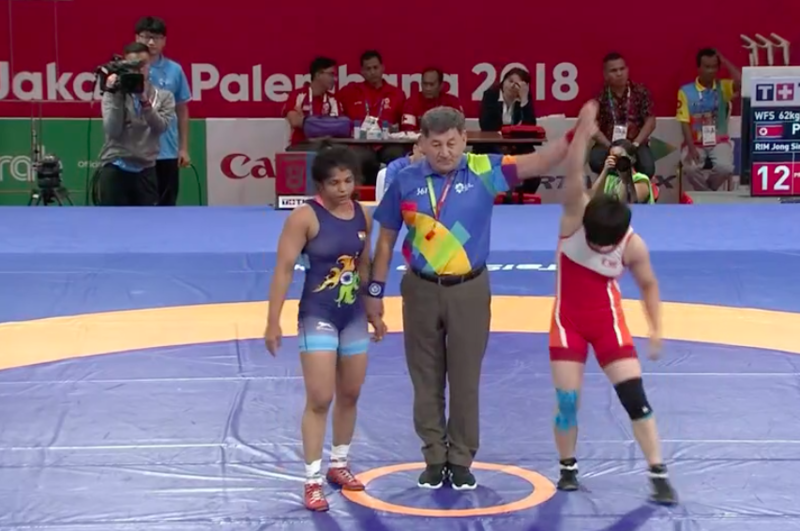 07:11 pm: Sakshi loses her bronze medal match. First period: Rim takes 4 points in the early going and almost managed to pin Sakshi but it only got worse from that point on. Sakshi was a bit too passive and paid the price for that. The North Korean was just too good; just too quick today and won 12-2 on technical superiority. The bout lasted just 2 minutes, 42 secs. 7:07 pm: Sakshi Malik’s bronze medal bout is up next. India’s men’s relay team (4x200 freestyle) finish 7th in the final. Pooja Dhanda misses out on a bronze medal. 1st period: The first point came thanks to the Japanese wrestler’s passivity. Pooja kept things under control and did enough to show that she can win the bronze. But this remains very close. 2nd period: Early in the second period, Sakagami outmaneuvered Dhanda to take two points. And then she added 4 points to her tally with two good moves. Dhanda was just too upright and the Japanese wrestler took advantage of that. 6:30 pm: Time for another medal bout. 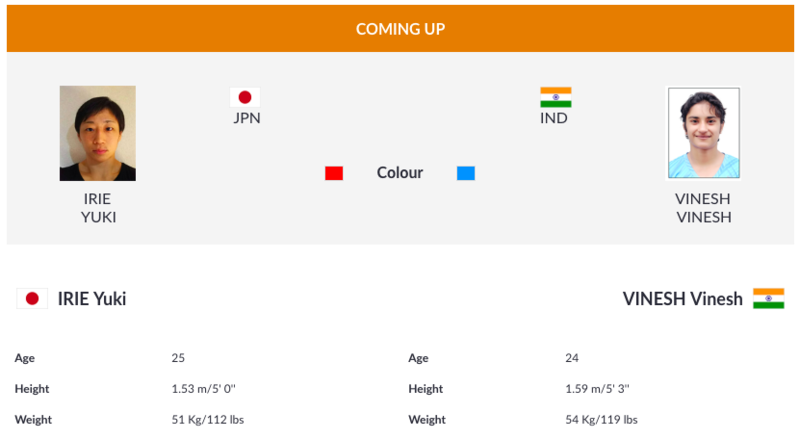 Pooja Dhanda is in action next against Japan’s Sakagami. August, 2016: A painful knee injury brought an end to her Olympics in Rio 2016. 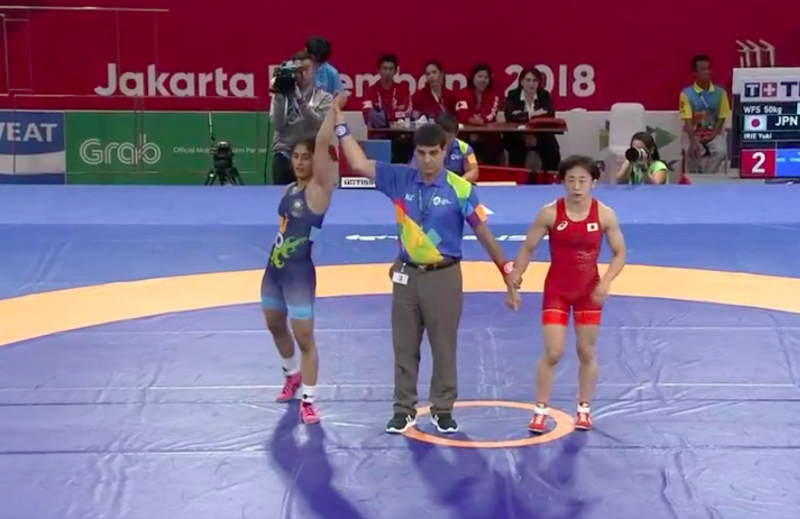 August 2018: She becomes the first ever female wrestler from India to win an Asian Games gold. Brilliant show by Vinesh. And Twitter is already buzzing! What a stupendous performance by @Phogat_Vinesh! First period: Vinesh almost managed to pin the Japanese wrestler in the first period. But Irie managed to somehow survive. Vinesh got 4 points and stormed into the lead. 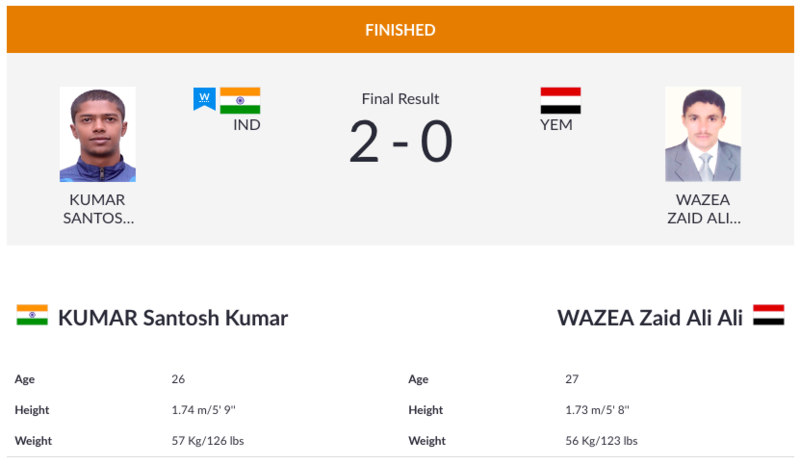 Second period: Superb defence by Vinesh ensured India’s second gold from the wrestling mat. With this, Vinesh became the first Indian woman to win a gold medal at the Asian Games. She is usually known for her aggressive style but defended well with the big picture in mind to clinch the gold medal. Vinesh has looked really good so far in the competition and it wasn’t an easy run. Almost time for Vinesh Phogat’s gold medal bout. 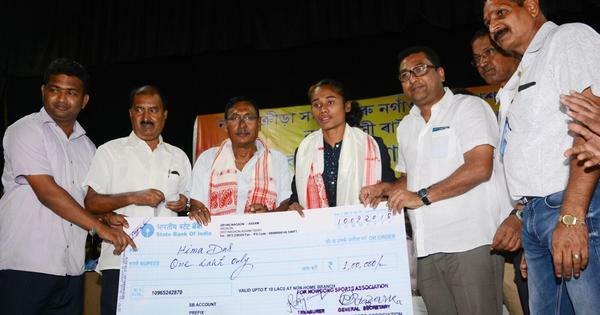 Can she become the first Indian woman to win a gold medal at the Asian Games? Ankita Raina and Prarthana Thombare put on a clinical display to thrash the pair from Pakistan, 6-0 6-0 in the women’s doubles round of 32 match. Over in the men’s doubles, Ramkumar and Sumit Nagal (a last-minute pairing) get off to a confident start with a 6-1, 6-1 win against Nepal. 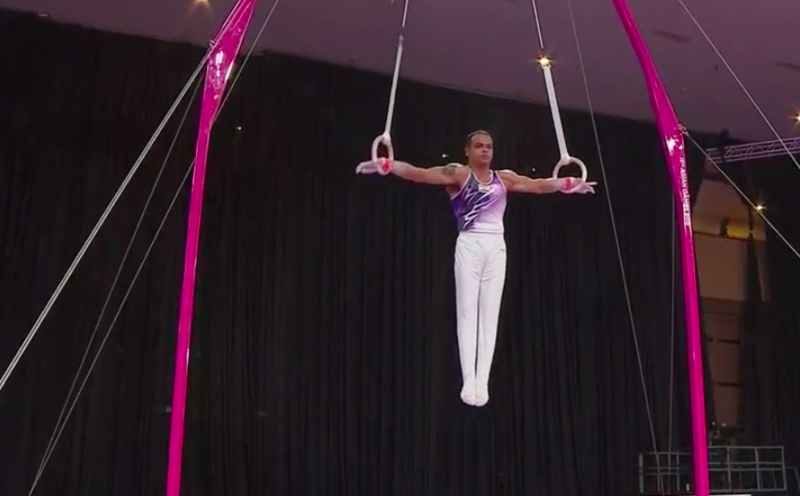 The team competition is on and Rakesh Patra was on the rings. It is his pet event and he got through his routine well but made a pretty poor landing. The scores of the team competition also decide qualification for the individual event finals. He got a score of 13.900. Let’s hope he makes the final. The men’s team’s wait for a medal since 1986 continues while the women’s team cannot repeat or improve their bronze from 2014. Tough draws and a disappointing return for the badminton contingent from the team events. 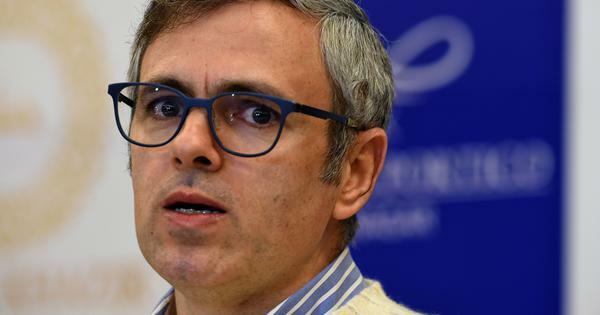 4.35 pm: Who is Lakshay Sheoran? Brief Description: Lakshay Sheroan is a promising, young trap shooter who has done well at the junior level internationally. Born in Jind, Haryana, he started competing only in 2014 and has been consistently climbing the ranks in the last four years. He is coached by PS Sodhi. At the selection trils, he pipped former world champion Manavjit Sandhu and Olympian Kynan Chenai, to become the India No 1. He will represent India in both men’s and mixed team trap at the Asian Games. The teenager was part of the bronze-medal winning team along with Vivaan Kapoor and Ali Aman Elahi at the ISSF Junior World Cup in Sydney, Australia earlier this year. He was also the junior national trap champion in 2017, beating stiff competition at the 61st National Shooting Championship in Kerala. His biggest win came at the ISSF Junior Shotgun World Cup in Porpetto, Italy, in August 2017 when he won the bronze in the mixed team trap competition with Manisha Keer. A month earlier, he had also won the silver in the Junior Men’s Trap at the 9th International Junior Shotgun Cup in Orimattila, Finland in July last year, along with the team bronze. He finished 15th in the final standings in junior ISSF World Championship Shotgun in Moscow last year. 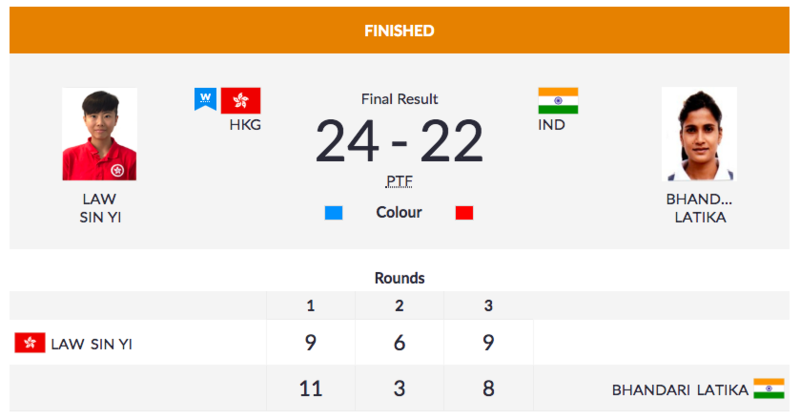 Indian men’s volleyball team opens their campaign with a 3-0 win over Hong Kong in Pool F. They won 27-25, 25-22, 25-19. India leading 11-8 at the break in the second game but the Indonesians evened it out at 15-15. The Indonesian pair then took 5 points in a row to get 5 match points before India got back three points. But it was too late. They lost the game 21-18 and the mach in straight games. India have lost the tie to Indonesia 1-3. Prannoy was the only player to get a win for India. India is assured of its first medal in Sepaktakraw after they assured themselves a place in the men’s team regu semifinal. In the Group stage, India defeated Iran 2-1 and lost to Indonesia 3-0 but advanced as the second best team in the group. There are only six teams in the competition and there will be no third-place playoff. Both the losing semi-finalists will get the bronze medal. Indonesia’s Fajar Alfian and Muhammad Ardianto take the first game against India’s Manu Attri and Sumeeth Reddy 21-14. It was a fairly straightforward affair. The second doubles match is about to begin. India’s Manu Attri and Sumeeth Reddy are taking on Indonesia’s Fajar Alfian and Muhammad Ardianto. India trail 1-2 in the tie. Prannoy fought back like a warrior to win the third game 21-19 and keep the tie alive. 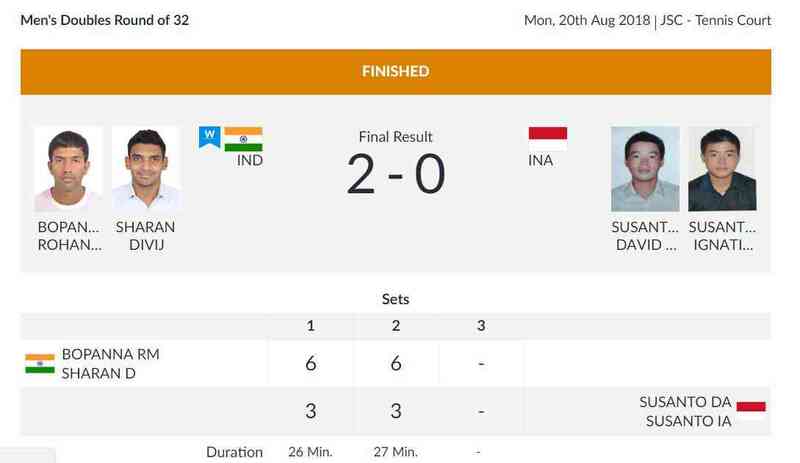 India had already lost the first two matches and a loss here would have meant that Indonesia would go through but Prannoy kept getting better as the match went on. He won 21-15, 19-21, 21-19. India’s Sumit wins his repechage round 2 match against Kazakhstan’s Oleg Boltin 7-0 to move on to the bronze medal match. 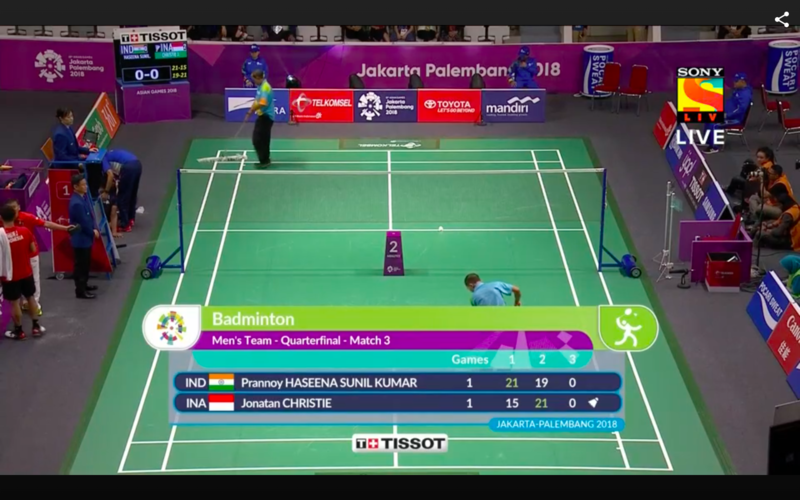 HS Prannoy wins the first game comfortably against Jonatan Christie, but the Indonesian fights back in the second to take a 17-11 lead. Prannoy then rolled his ankle during a rally and limped off the court, but returned to play. Christie won the second game 21-19 to take the match into a decider. Well, well. We’ve got some shocking news coming from the kabaddi arena. 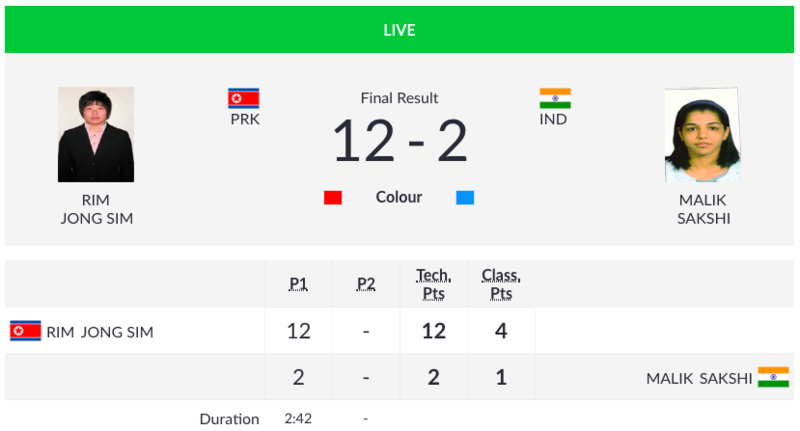 Korea have stopped the Indian juggernaut beating the Indian men’s team 24-23 in the third group game. Remember, Korea had also beaten India in the Kabaddi World Cup in 2016, but India had gone on to win the title. 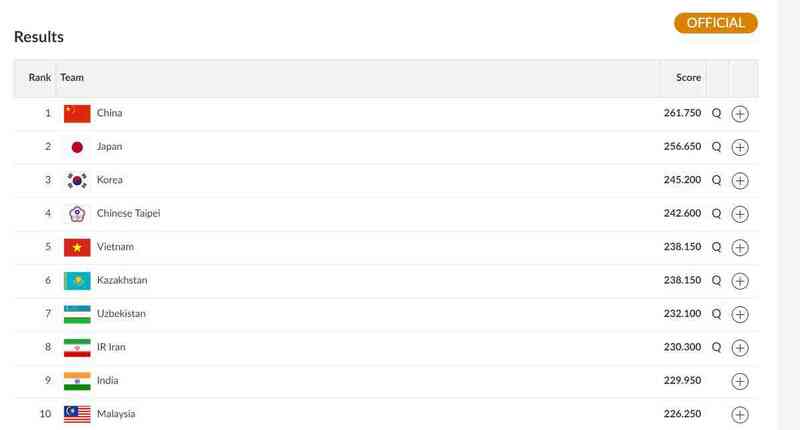 Regardless, this is the Indian kabaddi team’s first defeat at the Asian Games in history. 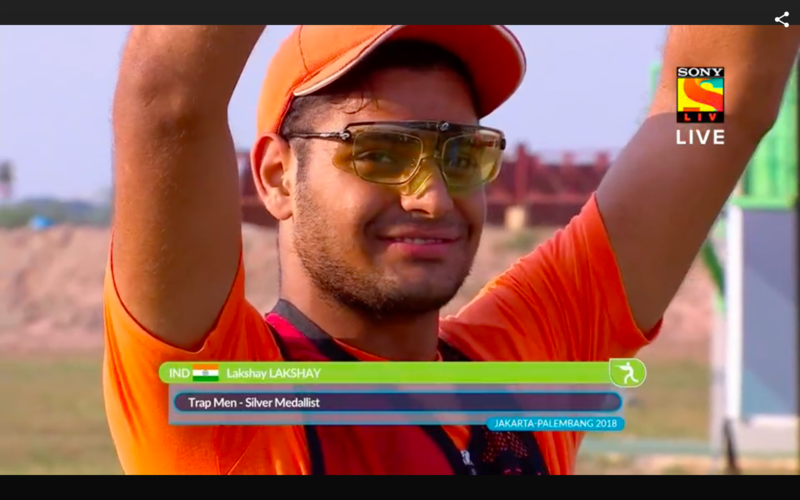 3.15 pm: It’s a silver medal for Lakshay Sheoran in the men’s trap! He scores 43 out of 50, missing one target in the final series. Chinese Taipei’s Yang Kunpei wins the gold with 48 out of 50. Lakshay and Yang Kunpi both score perfect series heading into the final round. Korea’s Ahn Daemyeong gets the bronze. Manavjit Sandhu misses three targets in the seventh series and that results in him being placed fourth, just missing out on a medal. Lakshay, meanwhile, is guaranteed a medal. Manavjit misses two targets in the sixth series, but just manages to escape elimination. Lakshay, meanwhile, has yet another perfect series. Manavjit and Lakshay are tied with Korea’s Ahn Daemyeong in second position behind Taiwan’s Yang Kunpi, who has a two-point lead. Meanwhile, we have had the first elimination. Both Manavjit and Lakshay miss one target each in the fourth of five series before elimination. Lakshay drops down to second, while Manavjit is fifth. Lakshay has another perfect series, taking his total to an impressive 14 out of 15. Manavjit misses one target in the third series to take his total to 12 out of 15. Lakshay is now tied for first place with two other shooters. Both Manavjit and Lakshay have perfect second rounds, hitting all five targets. Manavjit Singh Sandhu shoots three out of the first five targets, while Lakshay manages four. It’s not to be for Satwik and Chirag as they lose the decider 16-21 to the world No 1 pair of Marcus Gideon and Kevin Sanjaya Sukamuljo. The Indonesians win the match 19-21, 21-19, 21-16 to give their team a 2-0 lead against India in this best-of-five tie. The atmosphere in the men's doubles match between India and Indonesia is nuts. It's so loud entering the stadium should come with a 'warning: eardrums might burst' sticker. India have a fight and a half on their hands. Satwik nets a smash and the crowd goes crazy! Gideon and Sukamuljo have fought back and forced a decider in this fantastic battle after trailing 6-11 in the second game at one point. Can Satwik and Chirag bounce back in the decider? Vinesh Phogat is through to the final after beating Uzbekistan’s Dauletbike Yakhshimuratova by technical superiority after just over a minute. Easy peasy, lemon squeezy! Now, can she win the gold? Heartbreak for Sakshi Malik as she loses her semi-final bout against Kyrgyzstan’s Aisuluu Tynybekova in the last few seconds. Sakshi had a slender 7-6 lead as the second period neared its end and chose to be very defensive, but Aisuluu managed to push her towards the boundary line and threw her over, winning two points. The Indian camp challenged the call but it was unsuccessful. Sakshi looked distraught at the end. 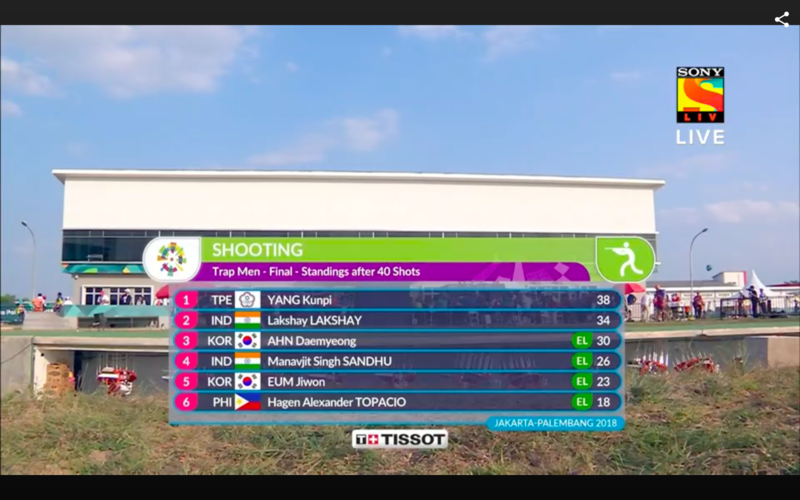 India will have two finalists in the men’s trap as Manavjit Singh Sandhu tops the qualification table after scoring 12 in the shoot-off. Lakshay comes in fourth. Both had scored 119 out of 120, along with two other shooters, which resulted in a shoot-off. The final will be held later today. 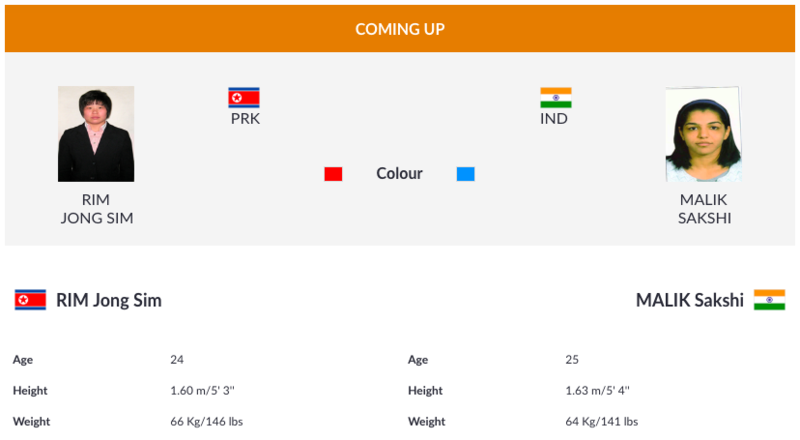 Pooja Dhanda is no match for North Korea’s Jong Myong Suk, who had beaten her in the Asian championship. Suk was always on top of Dhanda throughout the bout. Dhanda loses the match again by technical superiority. 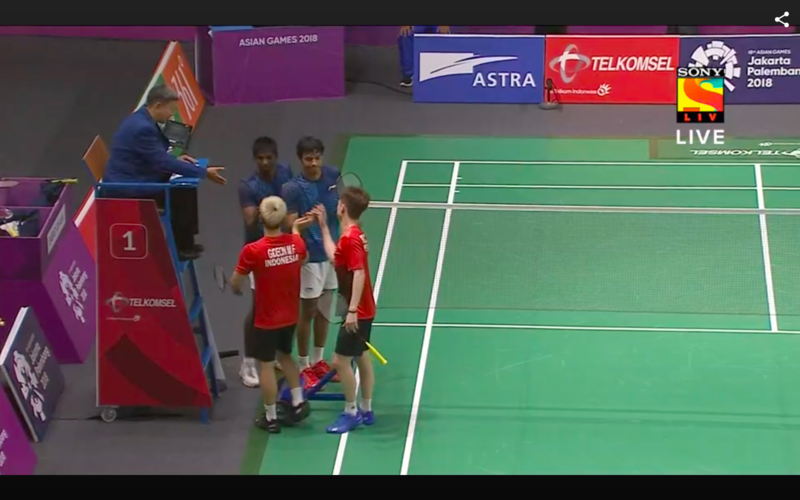 Satwiksairaj Rankireddy and Chirag Shetty have stunned the Indonesian crowd by coming back from 11-16 down against the world No 1 pair of Marcus Gideon and Kevin Sanjaya Sukamuljo to win the first game 21-19. Incredible turnaround! Sakshi Malik joins Vinesh Phogat and Pooja Dhanda in the semi-finals as she beats Kazakhstan’s Kassymova Ayaulym by technical superiority. It’s a rout in the third game as Anthony Ginting wins it 21-10 with some incredible badminton. Srikanth did not know what hit him. He loses the match 21-13, 22-20, 21-10, which means Indonesia take a 1-0 lead against India. Karman Kaur Thandi is through to the round of 16 after beating Mongolia’s Altansarnai Jargal 6-1, 6-0. Kidambi Srikanth saves a match point to come back and win the second game 22-20. We are into a decider! This is a fascinating match! Pooja Dhanda is also through to the semi-finals after beating Uzbekistan’s Nabira Esenbaeva by technical superiority. 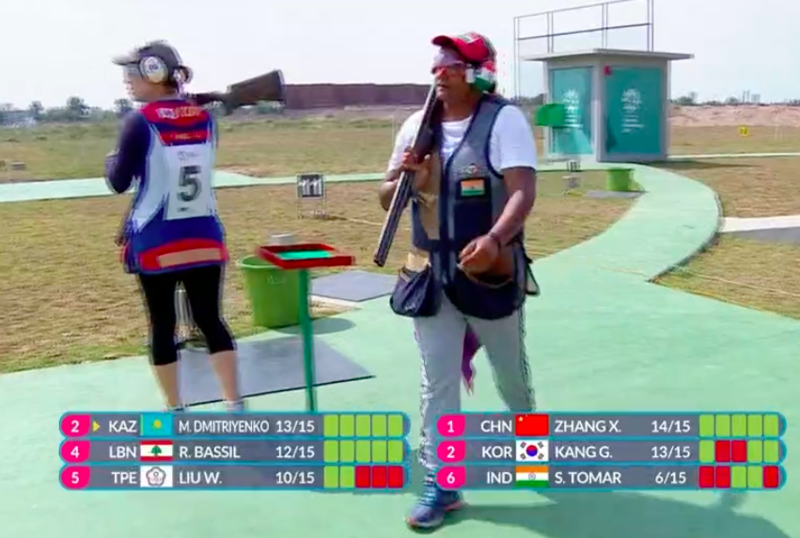 It’s all over for Seema Tomar as her poor start – she missed her first six shots – results in her being the first shooter to be eliminated. She only managed to hit 12 out of 25 targets. Vinesh Phogat wins her quarter-final match against Korea’s Kim Hyungjoo by technical superiority to move on to the semi-finals. Seema Tomar manages to hit only six out of the first 15 targets, and currently trails the next best competitor by seven shots. After missing her first six shots, Seema Tomar hits the next four targets to open her account in the final. She still trails the next best competitor by three points. Sakshi Malik needs less than two minutes to beat Thailand’s Salinee Srisombat by technical superiority and progress to the quarter-finals. Seema Tomar misses her first five shots to fall far behind the rest of the pack. None of the other shooters missed more than one. 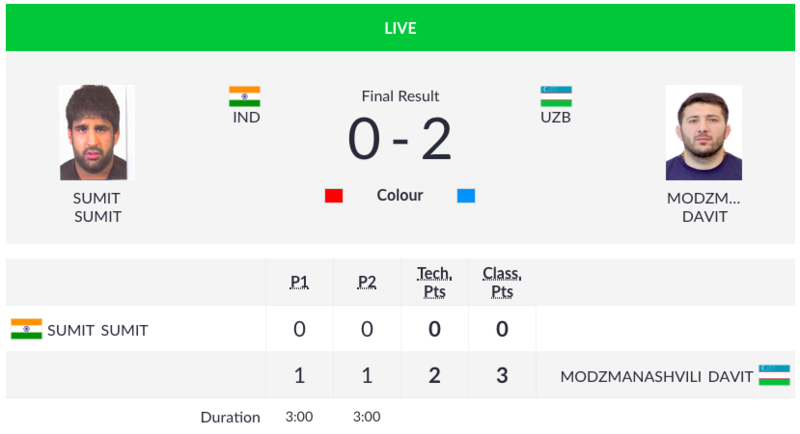 India’s Pinki gets knocked out in the first round itself by Mongolia’s Sumiya E, who wins by technical superiority. Pooja Dhanda takes just over a minute to beat Thailand’s Orasa Sookdongyor by technical superiority and book her spot in the quarter-finals. Deepak’s parents had sent him to Gurukul Academy in Dehradun for his schooling. He is a Sanskrit expert as well. “I am what I am because of Gurukul. It has taught me the true values of life. 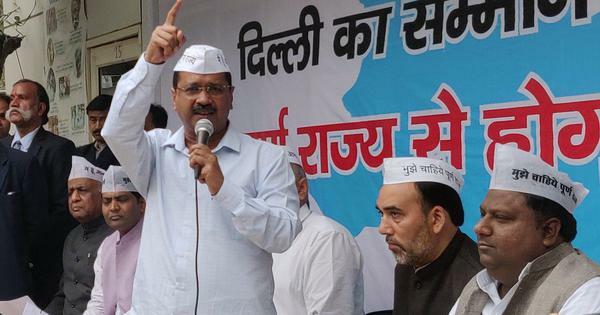 My parents sent me away from Delhi because they did not want me to study in a city environment,” he added. 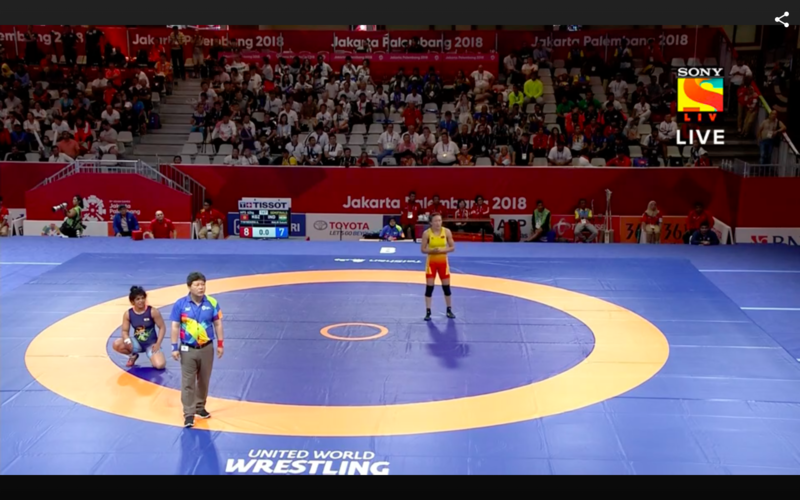 India’s Sumit is no match for Iran’s Parviz Hadi Basmanj, as he loses by technical superiority in the first period itself. Vinesh Phogat scores a two-point takedown early in the bout but ends up hurting her leg in the process. After a quick massage she is back on the mat. She tries to score more points in the first period but Sun Yanan’s defense is very good and the score remains 2-0 at the end of the first period. Vinesh gets the second period off to a strong start, scoring a four-point takedown, and follows it up with two more points. She ends up winning the match 8-2 to seal her progress to the quarter-finals. China’s Ruozhu Zhao wins the gold with a Games record of 250.9. Korea’s Eunhea Jung bags silver with 248.6, while Mongolia’s Nandinzaya Gankhuyag gets the bronze. 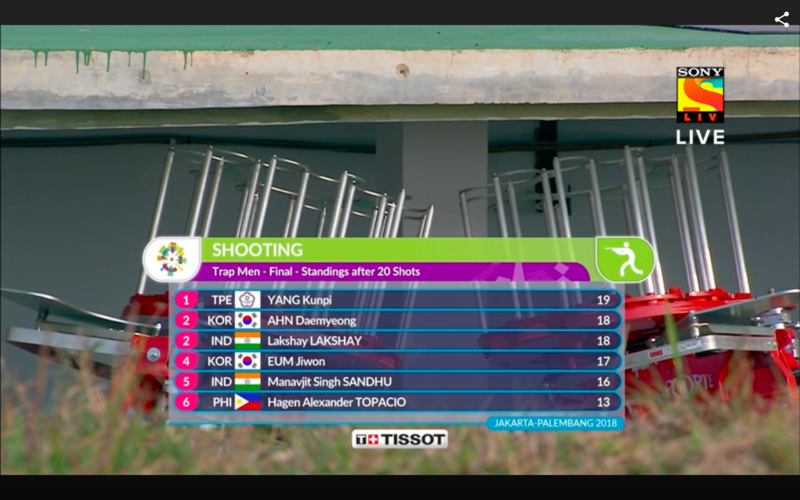 Disappointment for India as Apurvi Chandela is eliminated after 18 shots. A 9.8 on her 18th shot sealed her fate despite a great 10.8 on the 17th. Sindhu and Ashwini are no match for the world No 2 pair from Japan, as they lose 13-21, 12-21. And with that, India are eliminated from the women’s team event. 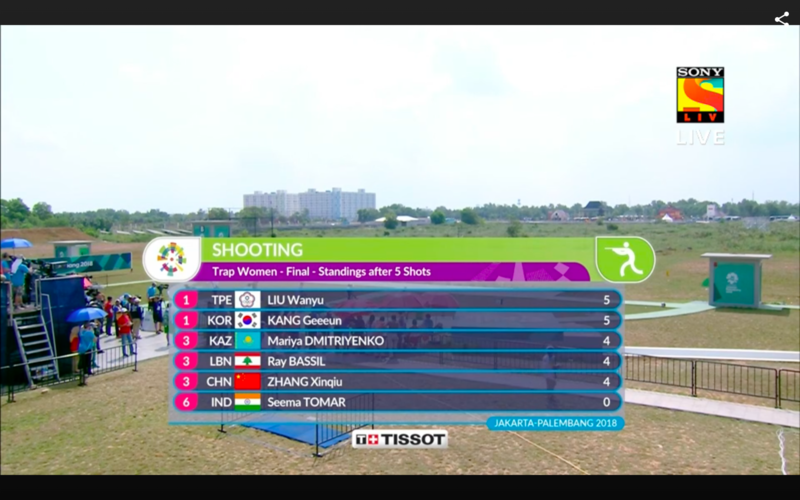 Apurvi Chandela rises to third after the first 10 shots. We will now move into the elimination stage. 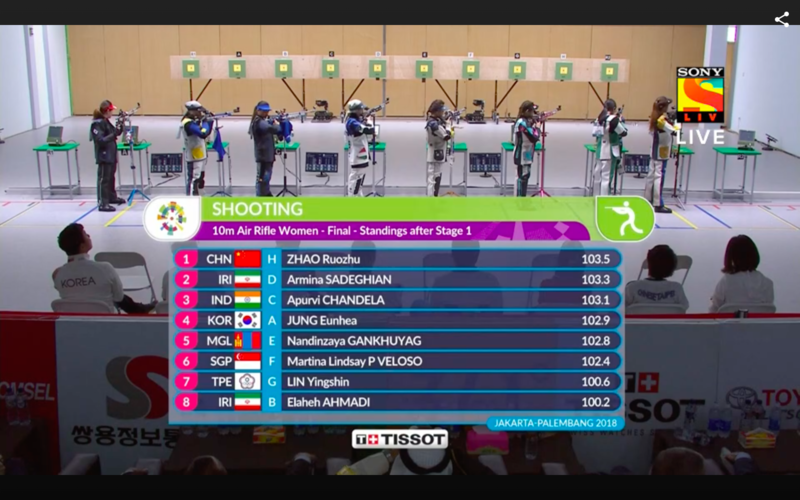 Apurvi Chandela stands fifth after the first 5 shots. India beat Thailand 45-19 in their group match. This was going to be an improbable ask anyway and so it’s proving to be for Sindhu and Ashwini. The Japanese world No 2 pair of Matsutomo/Takahashi lead 11-7 at the interval of the second game. India’s Neel Roy finished 13th overall with a timing of 2:08.07. He failed to make the cut for the final. 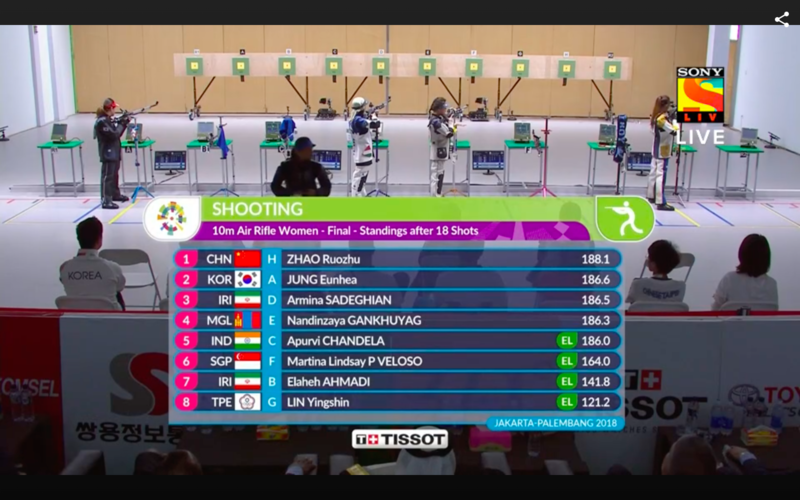 10.53 am: The women’s 10m air rifle final is just about to begin, with India’s Apurvi Chandela in the fray. India go down 54-104 against the Unified Korean team. That’s now 3 defeats in 3 games in the group stage for India. India’s Latika Bhandari loses to Hong Kong’s Sin Yi Law 22-24 in the round of 16. Matsutomo and Takahashi step it up after the interval, winning six points in a row to stretch their lead to 16-9, before taking the first game 21-13 in 18 minutes. Japan have one foot in the semi-finals. A winning start for Ankita Raina as she moves on to the round of 16 with a 6-2, 6-4 win over Indonesia’s Beatrice Gumulya. Ashwini and Sindhu put up a good fight against the world No 2 pair of Misaki Matsutomo and Ayaka Takahashi but trail 9-11 at the interval in the first game. Another final today for India in swimming, after two on Sunday. The men’s 4x200 freestyle team (Sajan Prakash, Srihari Nataraj, Saurabh Sangvekar, Avinash Mani) finish 7th overall in the heats to qualify for the final. 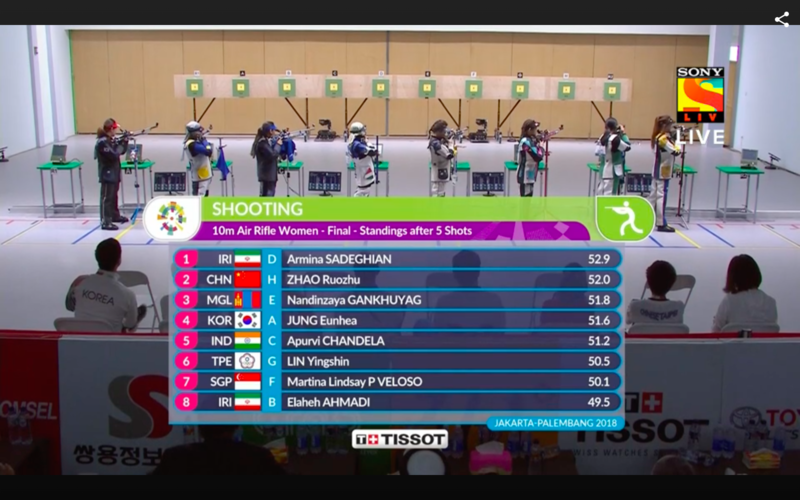 Apurvi Chandela is into her second final of the Asian Games, this time the 10m air rifle. After winning bronze in the mixed team event on Sunday, can she get another medal in the individual event? Find out soon...the final is scheduled to begin any minute. Saina Nehwal squanders five points in a row from 16-16 in the decider to hand Okuhara the match. What a see-saw match this was! Saina looked down and out at 11-21, 12-17 but fought back incredibly to take it till the end. However, it is Japan who have taken a 2-1 lead in this quarter-final tie. Now, it is up to Ashwini Ponnappa and PV Sindhu to keep India alive, against Matsutomo/Takahashi in the doubles. That’s going to be a tough ask. Saina Nehwal takes a slender 11-10 lead into the interval of the third game, before Okuhara sneaks ahead 15-13. Saina then pulls it back to 14-15 with a body smash and follows that up with another, and it’s 15-15! India’s perfect start in kabaddi continues. The women’s team defeats Thailand 33-23 in their second group game after crushing Japan in their first match. Indian youngster Lakshay shoots a perfect 25 in the fourth series to go on top with 96 points. Veteran Manavjit Singh Sandhu is ninth with 94 points. Trailing 12-17 in the second game, Saina Nehwal fights back to level the score at 20-20, before saving four match points against Okuhara. Saina eventually wins the second game 25-23 to force the match into a decider! What a comeback! Deepak Kumar wins the silver! China’s Yang Haoran wins the gold with a Games record of 249.1. Deepak’s score was 247.7. 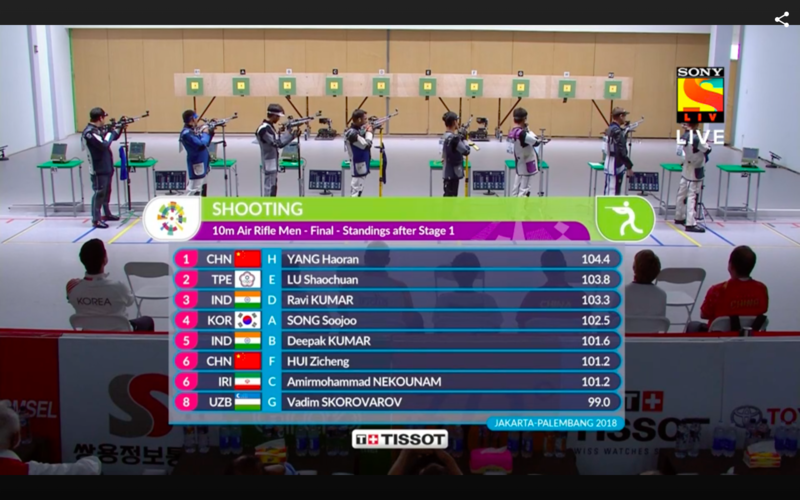 Deepak Kumar shoots a 10.8 to take him into the silver medal position. Chinese Taipei’s Lu Shaochuan gets the bronze. Ravi Kumar is eliminated. Deepak Kumar is guaranteed a medal. Korea’s Song Soojoo is eliminated, which means we are left with the final four, including two Indians. At least one medal is guaranteed for India. It’s not looking good for Ravi Kumar and Deepak Kumar. They are both fighting to stay alive in this final. 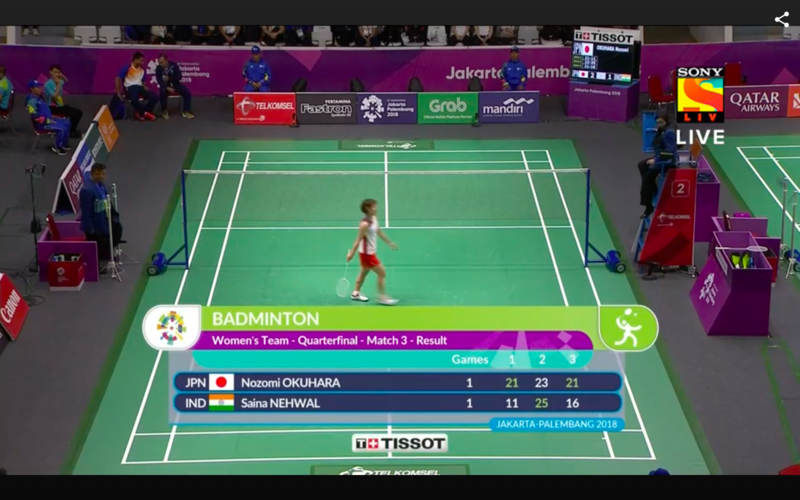 Saina Nehwal loses the first game to Nozomi Okuhara quite badly – 11-21. Will she be able to recover? Deepak Kumar drops down one spot to fifth, while Ravi Kumar continues to be third after 10 shots. Now, we will enter the elimination round. 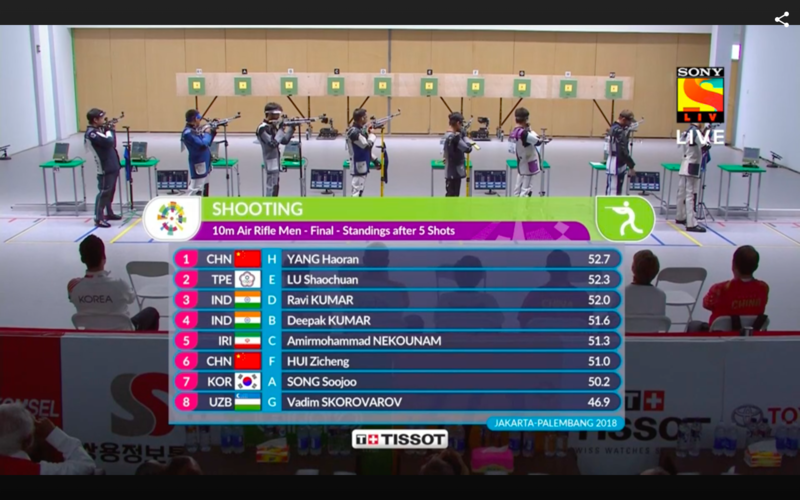 After the first five shots, Ravi Kumar and Deepak Kumar are in third and fourth positions respectively. 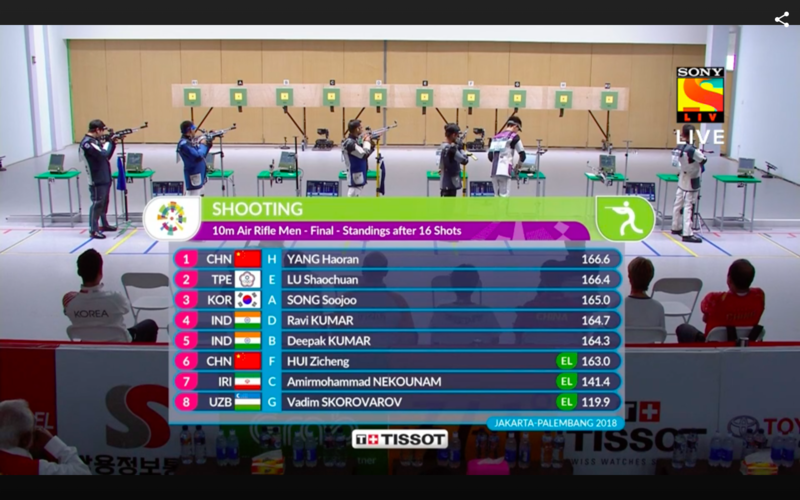 9.17 am: The men’s 10m Air Rifle final has just started, with Ravi Kumar and Deepak Kumar in the fray. India’s Sanatombi Chanu finishes eighth in Taijijian, which is a form of Wushu where the participants use a sword as the main element of the routine. India’s Swarn Singh, Dattu Bhokanal, Om Prakash and Sukhmeet Singh top their heat to book a spot in the final. 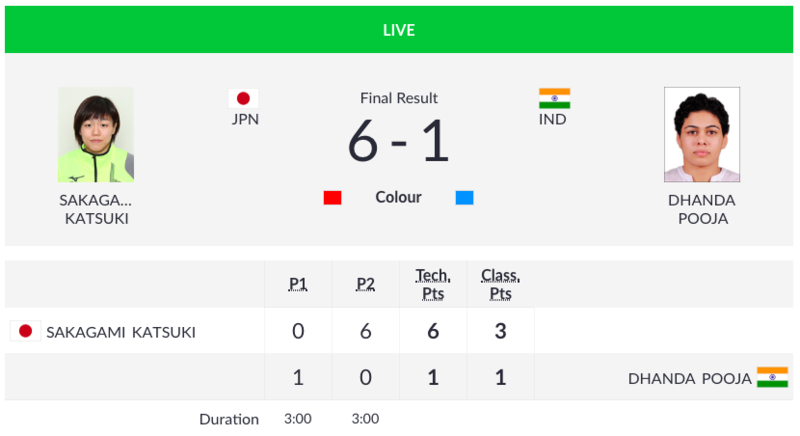 India’s Sikki Reddy and Arathi Sara Sunil lose the first game to world No 1 pair Sayaka Hirota and Yuki Fukushima 15-21 after putting up a good fight. 8.40 am: Congratulatory messages continue to pour in for India’s only gold medallist so far at these Asian Games – Bajrang Punia. Here are some of the other reactions on Twitter after his feat last evening. Rohit Kumar and Bhagwan Singh finish second in their heat, which means they will head to the repechage round. India’s Srihari Nataraj is the second reserve for the final. India’s Ravi Kumar and Deepak Kumar have both qualified for the final after finishing fourth and fifth respectively. 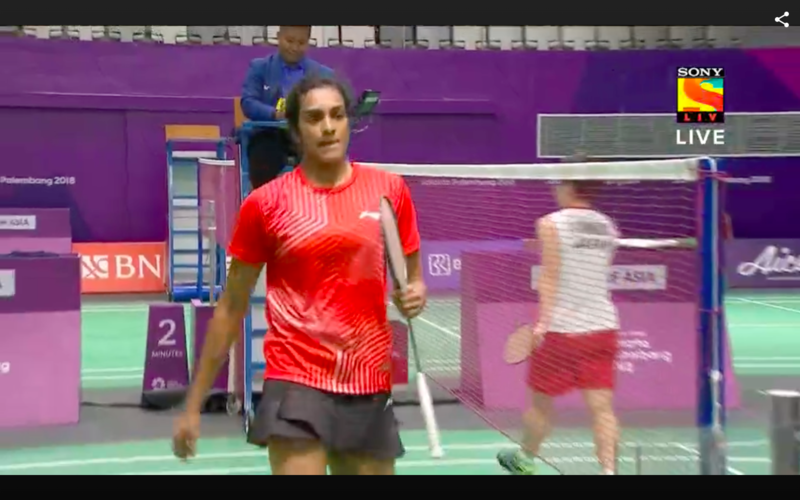 PV Sindhu beats Akane Yamaguchi 21-18, 21-19 to give India a 1-0 lead against Japan. The Japanese was too erratic with her shots and paid for it. PV Sindhu has a narrow 11-10 lead at the interval of the second game against Yamaguchi. 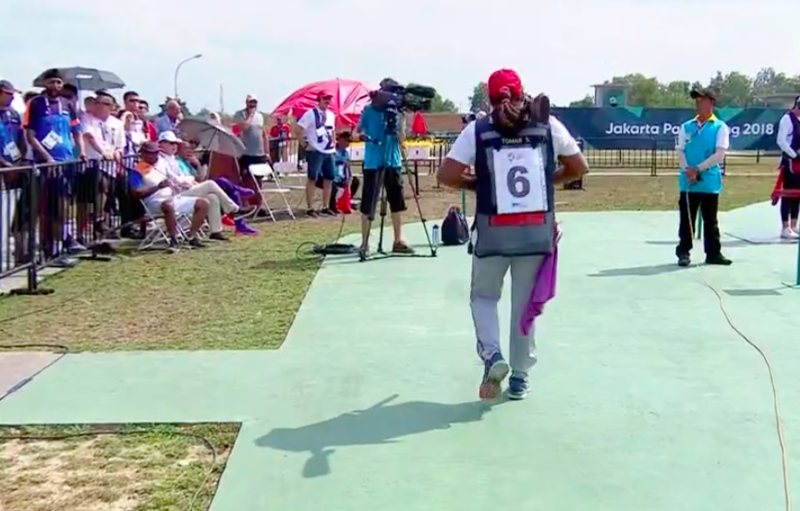 India’s Srihari Nataraj and Arvind Mani finish first and second in their heat, but will have to wait for other heats to end before finding out whether they have made the final. India’s Dushyant tops his heat with a time of 7:43.08 to qualify for the final. India’s 16-year-old swimmer Advait Page finishes an impressive third in his heat with a time of 8:09.13. Sindhu wins the first game against Yamaguchi 21-18. The 23-year-old profited from some errors from the Japanese to take a 18-15 lead, before Yamaguchi fought back to level it at 18-18. However, Sindhu stepped up the aggression to win the next three points. Seema Tomar shoots 22 out of 25 targets in round 4, taking her total to 93 and fourth position. Shreyasi Singh, meanwhile, can only score a 20, as she drops down to seventh spot with a total of 91. The leader, Kazakhstan’s Mariya Dmitriyenko has 96 after four rounds. Sindhu wins the first four points of the match before Yamaguchi wins the next five. The Japanese stretches her lead to 10-8, before Sindhu wins three points in a row to take a 11-10 lead into the interval of the first game. 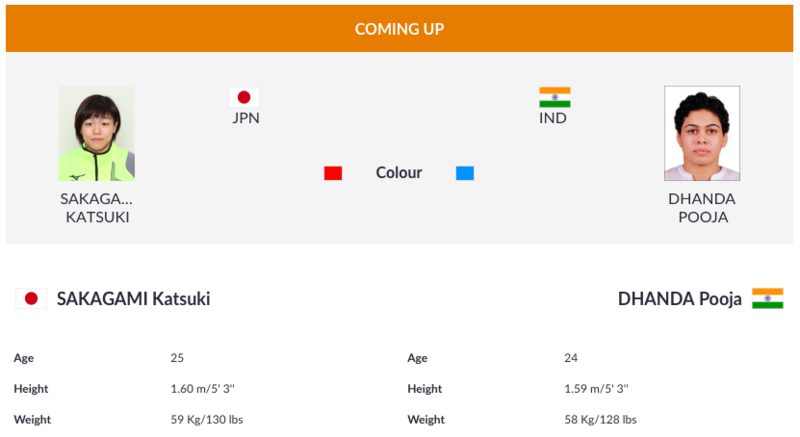 The women’s team quarter-final match between India and Japan is about to begin, and it’s PV Sindhu vs Akane Yamaguchi first up! Hope you’ve had your morning coffee! Deepak Kumar shoots a 104.1 in the second round to follow up his 103.7. Meanwhile, Ravi Kumar shoots 104.7 and 103.1 in the first two rounds. 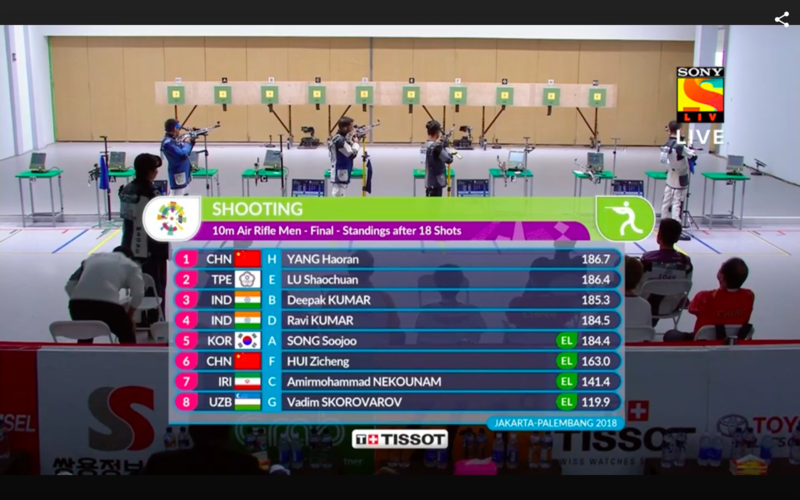 India’s Deepak Kumar shoots a 103.7 in the first round. The leader, China’s Haoran Yang, shot 106.4. 6.30 am: Day 2 has begun! Women’s trap shooting qualification and equestrian dressage are the first events. 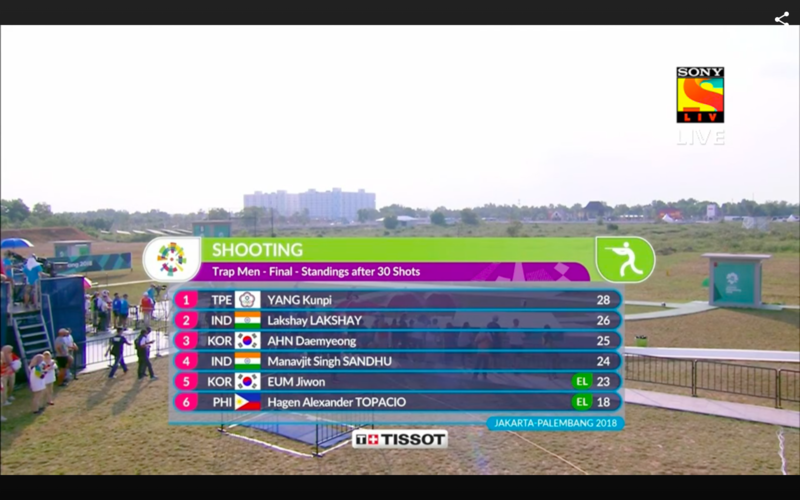 For India, there is a chance for both shooters to qualify in trap. On Sunday, Shreyasi Singh had shot a perfect score of 25 in the third round of qualification to rise up to second in the table with a total of 71 out of 75, while Seema Tomar was fourth overall a total of 71, but stands. Kazakhstan’s Mariya Dmitriyenko topped the table after Day 1, missing only one target out of 75 across three rounds. 6.10 am: Sushil Kumar has not won an official international wrestling bout outside the Commonwealth Games or Commonwealth Championships in the last four years. Read: Will the Asian Games defeat bring the curtain down on the Indian’s illustrious career? 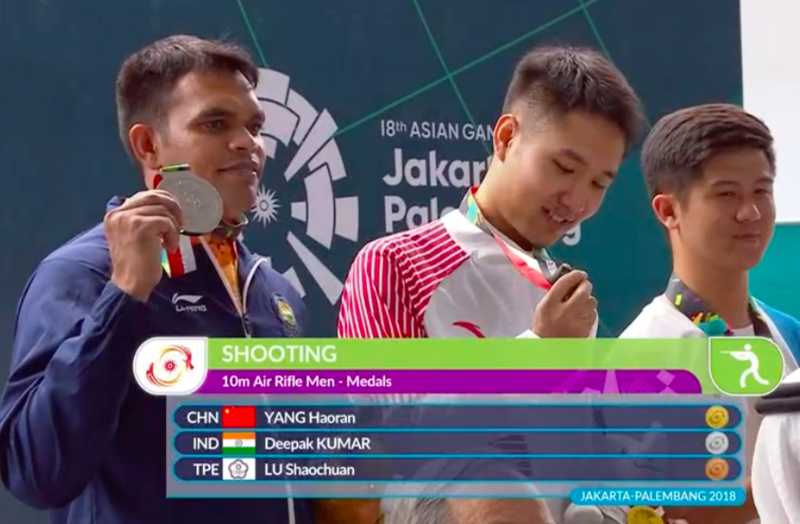 5.45 am: As we wait for the action on day 2 to begin, here’s a quick recap of how India won their first medal on day 1 – - a bronze in 10m air rifle mixed team. 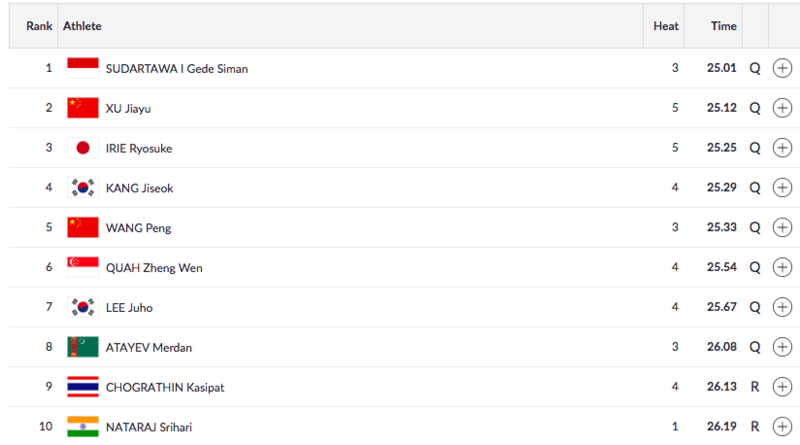 Good morning and welcome to The Field’s live blog for Day 2 of the 2018 Asian Games in Jakarta and Palembang. Monday will see Indian sportspersons in action in shooting, badminton, wrestling, kabaddi and hockey, among other sports. India’s star wrestler Bajrang Punia lived up to the expectations by winning the country’s first gold medal of the Games on Sunday. Punia brought smiles and relief to the Indian camp which was jolted by the early exit of star wrestler Sushil Kumar. Here is Abhijeet Kulkarni on whether the Asian Games defeat will bring the curtain down on Sushil Kumar’s illustrious career. 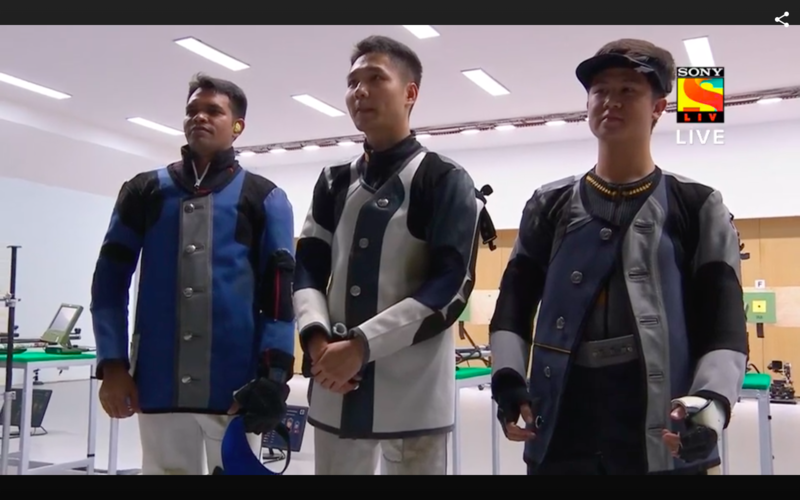 Earlier on Sunday, Apurvi Chandela and Ravi Kumar showed the value of consistency by winning India’s first medal in Indonesia, with a bronze in the 10m air rifle mixed team event. If you missed it, Zenia D’Cunha has got you covered here. The Indian women’s hockey team also got their campaign started with an 8-0 thrashing of hosts Indonesia. Gurjit Kaur bagged a hat-trick. Here is a recap. If you missed the action on Day 1, here is our live blog for Sunday and here are all the results.